Suppose I am a Jewish woman. Suppose I am in a taxi (or similar semiprivate place) with a male cab driver who I am quite sure is not Jewish. May I sing in front of him? Hypothesis: That since the prohibition of kol isha does not apply to non-Jewish men, I will not be guilty of lifnei iver by singing in this situation. Correct? 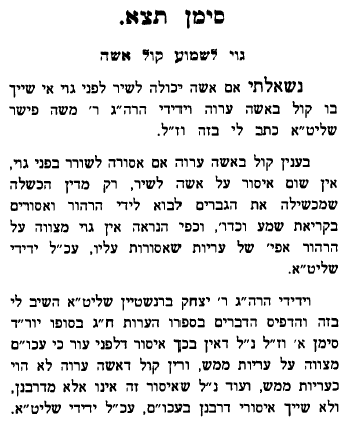 According to this Rivevos Ephraim 5:491 it should not be a problem since the problem is making a man stumble and come to impure thoughts and its assur during kiras shema and these things are not applicable to a non Jew. See the tshuva inside. There are two Rabbanim who answered in the tshuvah. additionally why do you assume singing is "being immodest" - modesty is a very fluid, subjective concept and can be defined very differently for different people. you only think its immodest because that is what you were taught to feel. Not the answer you're looking for? Browse other questions tagged halacha gentiles women kol-isha .